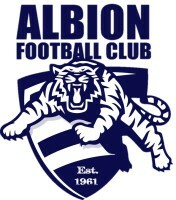 The Albion Football Club Are This Year Supporting The White Ribbon Foundation! Ahead Of The Western Region FL White Ribbon Round, Players From Our U19, Reserve and Senior Team Support And Understand That No Violence Against Women Is Acceptable! We At The Albion Football Club Are Saying 'NO' To Any Domestic Violence Against Women! Thanks To The Following Players And Coach!